The Kickstarter funding campaign is in full swing for Big Bad Con, the sweetest tabletop gaming convention on the West Coast. We quickly funded our basic goals on Day 1, and have been blowing past many stretch goals since. Several of these stretch goals allow us to bring great guests to the convention, to host games, speak on panels, etc. 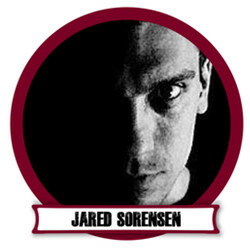 Today’s guest interview is with Jared Sorensen, of Memento Mori Theatricks. Could you introduce yourself? What would you like the Big Bad Con attendees to know about you? I’m a writer and game designer, one of the old-guard indie guys from the turn of the century; the creator of Lacuna Part I, InSpectres, Action Castle, and the co-creator of FreeMarket. I wrote for D&D Online, Lord of the Rings Online and a buncha other computerish things and I’m known for wearing lots of black. The Kickstarter funding campaign is in full swing for Big Bad Con, the sweetest tabletop gaming convention on the West Coast. We quickly funded our basic goals on Day 1, and have been blowing past many stretch goals since. Several of these stretch goals allow us to bring great guests to the convention, to host games, speak on panels, etc. 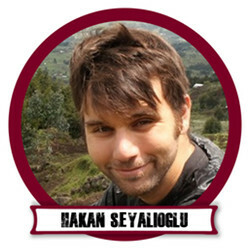 Today’s guest interview is with Hakan Seyalioglu. Hi there! I’m Hakan, one half of Thorny Games along with Kathryn Hymes and we’re on a mission to spread play through quirky and thoughtful games. People are hungry to tell stories in new and exciting ways, and whether that be at a table, moving around, inside or outside, we want to make that happen. With our game Dialect, A Game about Language and How It Dies, players tell a story about a language, and how the birth and death of that language mirrors the story of a community in Isolation. With Sign, A Game about Being Understood, players reflect on what having barriers to communication mean to us, through the true story of Nicaraguan Sign Language. The Kickstarter funding campaign is in full swing for Big Bad Con, the sweetest tabletop gaming convention on the West Coast. We quickly funded our basic goals on Day 1, and have been blowing past many stretch goals since. Several of these stretch goals allow us to bring great guests to the convention, to host games, speak on panels, etc. 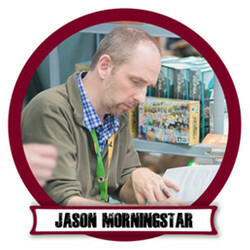 Today’s guest interview is with Jason Morningstar. The Kickstarter funding campaign is in full swing for Big Bad Con, the sweetest tabletop gaming convention on the West Coast. We quickly funded our basic goals on Day 1, and have been blowing past many stretch goals since. Several of these stretch goals allow us to bring great guests to the convention, to host games, speak on panels, etc. 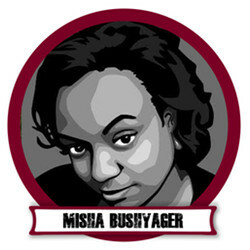 Today’s guest interview is with Misha Bushyager, who writes for Unruly Designs. I’m Misha, data analyst by day and gamer whenever I can. I’ve got two great kids I’m slowly introducing to gaming and a husband who tags along for the ride when he can. I’ve been a player for over half my life now, and recently plunged into the producing side. The Kickstarter funding campaign is in full swing for Big Bad Con, the sweetest tabletop gaming convention on the West Coast. We quickly funded our basic goals on Day 1, and have been blowing past many stretch goals since. Several of these stretch goals allow us to bring great guests to the convention, to host games, speak on panels, etc. 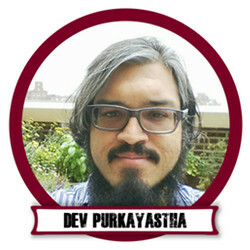 Today’s guest interview is with Dev Purkayastha. The Kickstarter funding campaign is in full swing for Big Bad Con, the sweetest tabletop gaming convention on the West Coast. We quickly funded our basic goals on Day 1, and have been blowing past many stretch goals since. Several of these stretch goals allow us to bring great guests to the convention, to host games, speak on panels, etc. 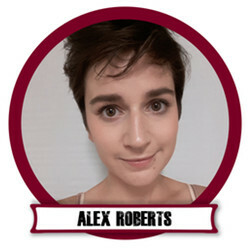 Today’s guest interview is with Alex Roberts. I’m Alex, from the computer! I do this show on the ONE SHOT Podcast Network called Backstory, where I interview all kinds of people about their contributions to the gaming community – designers, organizers, scholars, and more! Behind the scenes, I do administrative and project management type stuff for Pelgrane Press and Bully Pulpit Games. I also write for games sometimes–you’ll see contributions from me in Dialect, Sig, Threadbare, the next edition of Misspent Youth, to name a few. I’m also trying my hand at design these days… I have a piece in the #Feminism supplement that Pelgrane is putting out, and Tension, my 2-player Jenga-based RPG about forbidden love, is currently in open playtesting! To be honest, I really don’t remember. I’ve been playing role-playing games since 1983 and that’s a lot of game sessions. I know that sessions used to be longer when I was young; as age and time commitments increased, average game session length decreased. Moreover, a lot of streamlined rule sets now allow intense gaming experiences in as little as a couple of hours. Would weekend-long LARP sessions count? That would have to be my longest, I guess, and they date back to the mid-1990s with the Adventurers’ Inn.